Do you know what departments or product categories are profitable at your store and, more importantly, what are not? Having a hunch doesn’t count. 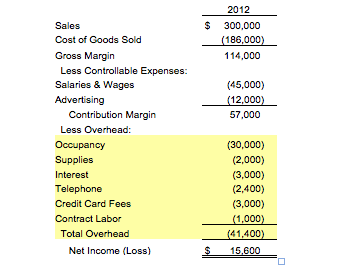 You need profit and loss statements at the department- or product-category level. Only when you know where your profits lie can you make the best decisions that maximize profitability. In addition, departmental profitability can be an important item on a manager’s report card, whether for the purpose of designing an incentive plan or for measuring his or her effectiveness. Departmental profit and loss statements give you an objective way to judge a department manager’s performance. The choice of whether to make a departmental or a product category statement is up to you, but it needs to have point-of-sale data. For most people, the department level is sufficient, but eventually, you may want to drill down a bit deeper. The dollars now left are called contribution margin and represent what that department is actually contributing to the overhead of the business. If that department didn’t exist, most, if not all, of those overhead costs would still exist and would have to be taken up by another department. Next, subtract the department’s share of overhead expenses to find the profit or loss. But what is that share? Sometimes, we can directly attribute expenses to a particular department at a transaction level, but most of the time, the expense is either paid on a store-wide basis (office supplies, for example) or the sheer number of transactions makes the exercise inefficient. In that case, we make an allocation of the total store expense to the department based on some activity measure. 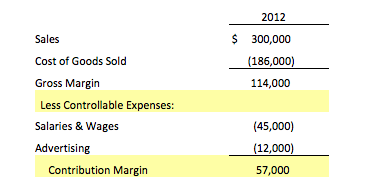 This example shows a department with a profit, but what if it shows a loss? Should we exit that particular segment of the business? The all-purpose accountant’s answer to that is, “It depends!” If the department is contributing to overhead, it may be worth keeping and adjusting its expenses to a profitable level—perhaps a smaller staff or a small physical footprint to lower its occupancy costs. If, on the other hand, the department has a negative or very low contribution margin, it may be time to rethink that part of your business. Perhaps you could be making more profits by focusing on the departments that are profitable, both from a time and an inventory investment standpoint. The key to all of these decisions is, of course, making sure your allocations are as accurate and fitting as they can be. You will then be on your way to maximizing your profitability.